As a “crowd favorite” financial data API platform, how should Alpha Vantage design its platform strategy that scales and provides sustainable competitive advantage? In Summer 2017, millions of tech-savvy individual investors around the world realized one ominous fact: The Yahoo Finance API has been shut down after its parent company had been acquired by Verizon. For more than a decade, the Yahoo Finance API had been the only free data source for global stock and currency markets, while enterprise-level data providers such as Bloomberg and Thomson Reuters charged exorbitant fees for data access. 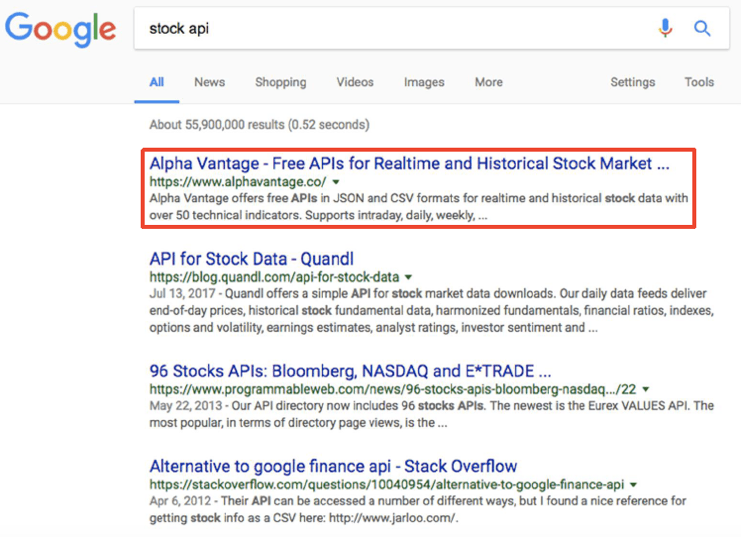 Scrambling for an affordable, high-quality alternative, those “yahoo finance shipwreck refugees” were pleasantly surprised to find on search engines (Figure 1) that a relatively unknown company – Alpha Vantage – had quietly launched a better version of the Yahoo Finance API. In this blogpost, we survey the strategy of Alpha Vantage against the industry backdrop of financial market data platforms. Figure 1. The Alpha Vantage Financial Data API service achieved No. 1 organic search results on Google when the Yahoo Finance API was discontinued after the Verizon acquisition. Alpha Vantage is a cloud-based API service that provides a variety of financial market data feeds to any user around the globe who has an internet connection. Its existing portfolio of data feeds include stocks, ETFs, mutual funds, physical currencies, and digital currencies such as Bitcoin (Figure 2). Launched in March 2017, the Alpha Vantage now has around 60,000 registered users, fielding over 200 million daily API requests from a global user base. The API service creates values for two categories of users. For software developers, Alpha Vantage provides an industry-standard RESTful data feed to help the developers integrate any finance/investing-related experiences into their software applications (e.g., a wealth management iOS/Android app, an interactive stock visualization tablet app, etc.) For tech-savvy individual investors, Alpha Vantage provides historical and realtime financial market data for investors to build, test, and simulate their trading strategies. As of February 2018, Alpha Vantage has a roughly 50/50 split in terms of the two user categories described above. Figure 2. Alpha Vantage offers a portfolio of affordable, high-quality data feeds spanning stocks, ETFs, mutual funds, physical currencies, and digital currencies such as Bitcoin. From the outset, Alpha Vantage has been positioned as an innovation platform that provides the “raw ingredients” for software developers to build compelling financial and trading software applications. 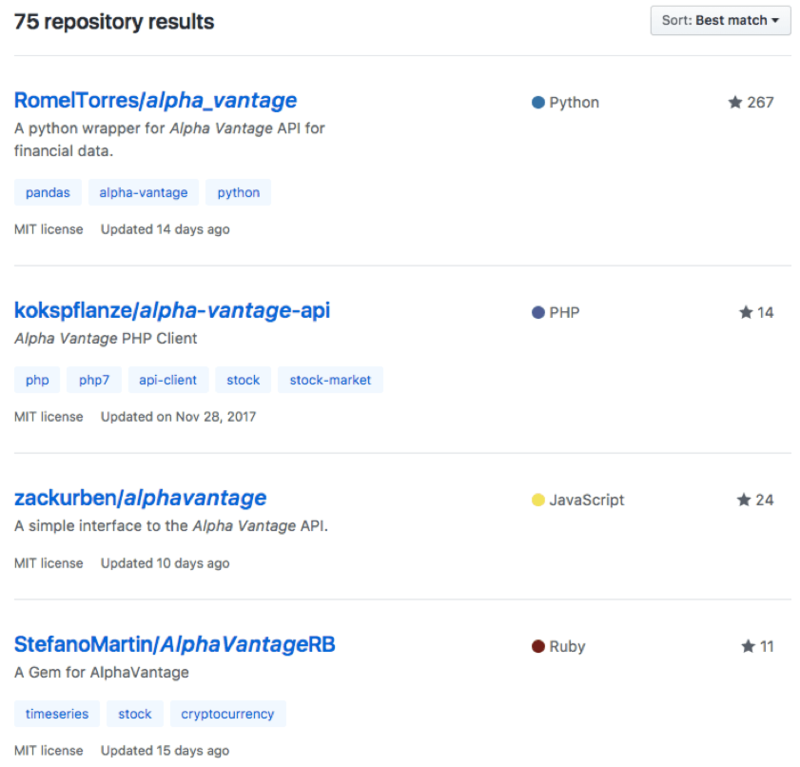 Alpha Vantage’s free, high-quality APIs have been well received by the software developer community, as manifested by the backing of vibrant open-source communities on GitHub (Figure 3), StackOverflow, and other prominent sites where developers congregate. 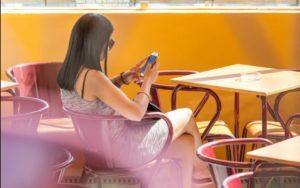 Unlike other innovation platforms such as iOS or Android, however, Alpha Vantage does not own an “app store” and has limited visibility into the exact types of applications enabled by the API service. Such limitation has exposed Alpha Vantage to the risk of disintermediation, bringing significant friction to the value capturing process. Figure 3. Alpha Vantage adopts an “open platform” strategy that encourages external software developers to create third-party applications, libraries, and SDKs on top of the Alpha Vantage data feeds. To date, over 70 open-source software applications have emerged on the popular software development website, GitHub. Alpha Vantage has experimented with two value capture mechanisms to date. The first mechanism is a SaaS-based freemium subscription model where premium features (e.g., unlimited API calls, exclusive data feeds, etc.) are accessible through a tiered-pricing structure. However, the low multi-homing tendency in the financial data API market, coupled with significant cross-side network effects among application builders and consumers, has bred a competitive dynamic characterized by price under-cutting and excessive marketing spending, both of which are unattractive and unsustainable to a bootstrapped and cash-constrained business. The second value capturing mechanism is the “data play” reminiscent of the Ant Financial case in Digital Innovation and Transformation. 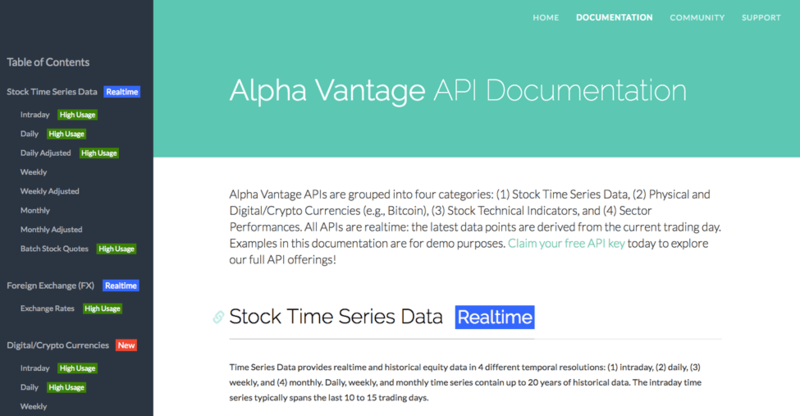 Fielding over 200 million API calls on a daily basis, Alpha Vantage has inadvertently become a barometer of financial market sentiments with a growing userbase covering major stock exchanges around the globe. How can Alpha Vantage leverage the streams of data coming into its platform and derive value and insights from its growing data assets? One thing is clear: the “data play” would be capital- and talent-intensive. 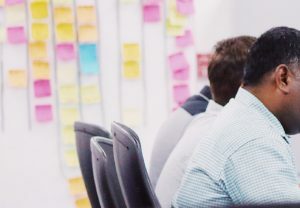 In February 2018, the founders of Alpha Vantage gathered in the Innovation Lab (iLab) of Harvard Business School to finalize their product roadmap and platform strategy going into the new year. How could Alpha Vantage effectively mitigate the disintermediation risks surrounding their API platform? How could they build a competitive “moat” around their core API offerings? What monetization strategy should they choose to scale up the business as the total number of registered API users was expected to reach 100,000 by the Harvard Commencement in May 2018?